On September 9th the Pechersk District Court made a decision in the civil case initiated by Volodymyr Kuznetsov against the “Mystetskii Arsenal,” regarding the copyright on the artist’s destroyed mural in the institutions. These decisions partially satisfied the artist’s claim, including moral damages he recovered. The appeal will take place on December 3rd, at 11:30 in Solomenskiy Appeal Court of Kyiv. The court ruled in favor of only a part of the artist’s claims. He was granted 1,000 (one thousand) hryvnas 00 kopiyka (around 50 $) for moral damages. These were awarded because the court ruled that the Arsenal did not give the artist an opportunity to make a photo documentation before destroying his work. The court decision did not mention anything about copyrights damages. 1.To officially recognize the actions of the State Enterprise “National Cultural Art and Museum Complex “Mystetskyi Arsenal” of painting over the work by Volodymyr Kuznetsov “Koliivshyna. The Last Judgement” as unlawful, and a breach of intellectual property rights of the author. 2.To be awarded 1,000 (one thousand) hryvnas 00 kopiyka in damages and 121,800 (one hundred twenty one thousand eight hundred) hryvnas 00 kopiyka for material damages from the State Enterprise “National Cultural Art and Museum Complex “Mystetskyi Arsenal”. 3.That the State Enterprise “National Cultural Art and Museum Complex “Mystetskyi Arsenal” publish, at their own cost, information about the breach of copyright in regard to Volodymyr Kuznetsov, the grounds for this breach, as well as corresponding apologies in mass media, in particular in Ukrainska Pravda, within a 2 (two) month period starting from the date of the court’s decision. 4.That the State Enterprise “National Cultural Art and Museum Complex “Mystetskyi Arsenal” pay related legal costs. The defendant’s representative was asked whether he thinks a painted work and a photograph of that work are the object of the same copyright. He explained that it is the same work, but photographed, because there are different media. The defendant’s representative could not cite clear provisions for organizing exhibitions in the Arsenal to the representative’s plaintiff. In the absence of the possibility to present such protocols, the plaintiff’s representative expressed the wish to have a future conversation with Natalia Zabolotnaya, about the possibility of establishing such provisions. The hearing was adjourned until September 9, 2015, when additional disclosures will be revealed. 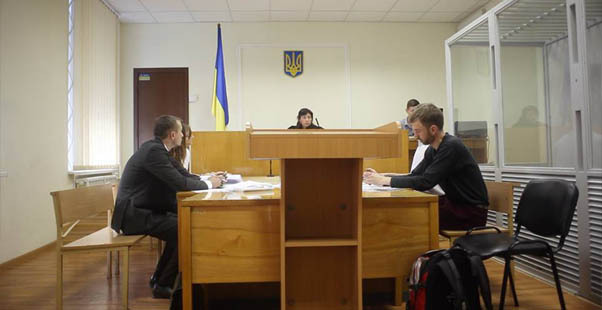 At the court hearing, only the plaintiff (Volodymyr Kuznetsov) and his representative (the lawyer) were present. The other people involved in the case did not present themselves before the court, although they had been duly informed. On May 19th, a request was filed by the third party (N. Zabolotnaya) and her representative to postpone examining the details of case to another date. The hearing was then adjourned to June 30. The lawsuit of Volodymyr Kuznetsov against the State Enterprise Mystetskyi Arsenal begins on 21 May 2015 in Kyiv Pechersk District Court. The artist says the action relates to the destruction of the artwork “Koliivshyna. The Last Judgement”. In July 2013, it was painted over with black paint at the order of the Mystetskyi Arsenal’s Director [Nataliya Zabolotna]. 1. Recognize the actions of the State Enterprise “National Cultural Art and Museum Complex “Mystetskyi Arsenal” of painting over the work by Volodymyr Kuznetsov “Koliivshyna. The Last Judgement” as unlawful and a breach of intellectual property rights of the author. 2. Recover 1,000 (one thousand) hryvnas 00 kopiyka in damages and 121,800 (one hundred twenty one thousand eight hundred) hryvnas 00 kopiyka for material damages from the State Enterprise “National Cultural Art and Museum Complex “Mystetskyi Arsenal”. 3. Require the State Enterprise “National Cultural Art and Museum Complex “Mystetskyi Arsenal” to publish, at their own cost, information about the breach of copyright in regard to Volodymyr Kuznetsov, the grounds for this breach as well as corresponding apologies in mass media, in particular in Ukrainska Pravda within a 2 (two) month period starting from the date the court decision is enacted. 4. Obligate the State Enterprise “National Cultural Art and Museum Complex “Mystetskyi Arsenal” to pay related legal costs. “This is not a question of personal relationship or personal attitudes. I accepted the personal apology of the Arsenal’s Head and forgave the insult. However, the thing here is not about apologies, but about addressing the public with a social and political gesture. With this trial, I want to draw public attention to the problem of artist-institution relations and to the legal vulnerability of the workers in the arts and culture when dealing with culture functionaries,” said Kuznetsov. The artist believes that the trial will initiate positive changes in the cultural field and will help to build fairer and clearer relations with workers in the arts and institutions. “I also want to raise questions about the narrowing interpretation of the notion of censorship in our country, about the lack of legal obligations even in state exhibition spaces, not to mention the private galleries,” Volodymyr Kuznetsov believes. In his opinion, since there is no clear definition of censorship in Ukrainian law, the trial that he initiates will allow to classify future censorship issues more clearly. “The Last Judgement” in Pechersk Court or why I am initiating a trial. 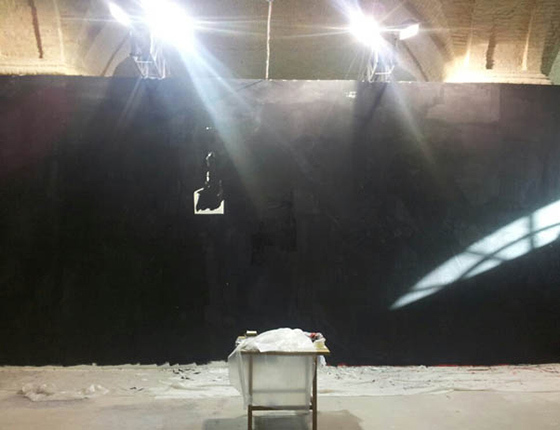 For more background on this case read Ukrainian Museum Director Destroys Critical Painting Ahead Of President’s Visit.